Apache NetBeans (incubating) 11.0 is the third major release of the Apache NetBeans IDE. It was released in March, 2019. Click here to download this release. Laszlo Kishalmi has been our Release Manager. There’s been lots of discussion in the Apache NetBeans Community about how best to express the fact that Apache Maven and Gradle are more modern choices to be aware of than Apache Ant, while at the same time not implying that there’s anything wrong with using Apache Ant. Discussions started back in 2018, and culminated in 2019 with the new "New Project" wizard redesign. We have moved the previous wizard Java options to a subfolder named "Java with Ant", and added two new options: "Java with Maven" and "Java with Gradle". We hope this makes it easier for everybody to choose a build system of their liking (be it Maven, Gradle or Ant) for their projects. For more information about the discussion and the rationale behind these choices please see this blog post. 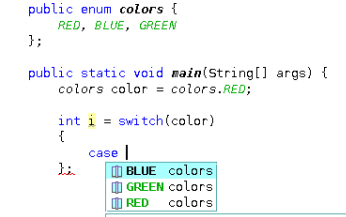 As you may know, the Apache NetBeans IDE can use a special variation of a Java compiler called nb-javac, that greatly improves the Java support. This nb-javac tool (which is not an Apache Project as it’s released under the GPL license) has been improved to support advanced JDK 12 features. Apache NetBeans Team Members Arunava Sinha, Sarvesh Kesharwani, and Vikas Kumar Prabhakar have made a heroic effort to integrate Apache NetBeans with this latest release of nb-javac. The switch expression handling has been greatly improved in this release. Better formatting, better re-indentation, better syntax-highlighting, better hints and better auto-completion. Goto Build > Compiling pane and add --enable-preview in "Additional Compiler Options". --enable-preview does not work in Maven projects in Apache NetBeans 11 as of yet, but the issue is being tracked here. See our wiki for more improvements to the switch expression. We have been busy in the last months reviewing the licenses of the enterprise cluster, that was included in the second donation from Oracle. The review has now ended (after lots of pull requests) and we have included this cluster in Apache NetBeans 11.0. This means that you can now build JavaEE applications with Ant, Maven or Gradle projects. Explicit support of Java EE 8 is not currently part of Apache NetBeans 11.0. Also, JavaEE 8 only runs on JDK 8, not on later releases, and so if you 're doing development with JavaEE 8 it’s best to run NetBeans itself on JDK 8. In order to comply with the Apache License we had to drop support for JBoss 4, WebLogic 9 and the module websvc.switmodellext had to be dropped as well. In late December, 2018, Apache NetBeans Team Member Laszlo Kishalmi kindly donated his Gradle works to Apache NetBeans. Since then he has been steadily working very hard to solve many issues and doing improvements. Open Gradle projects out of the box. Gradle Task Navigator, run tasks by double-click. 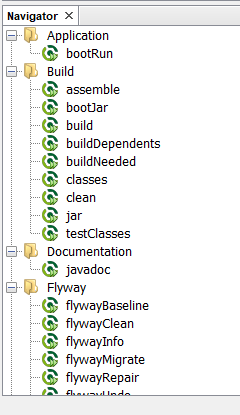 Gradle supported unit test frameworks (JUnit 4, 5, TestNG) works with Code Coverage with JaCoCo. Gradle projects work together with NetBeans JPA and Spring Support. Customizable task execution and IDE action binding. Run, Debug and Test even single methods. Creating new projects with Gradle. Eirik Bakke has added support for HiDPI icons for window system icons on Windows and Mac. This introduces vector-drawn icon implementations for the icons used in the window system’s Windows 8 and Aqua LAFs. Also, for this release the Apache NetBeans Team has been busy fixing 99 issues. Many of these tutorials are being reviewed. See these guidelines if you want to help with the review. 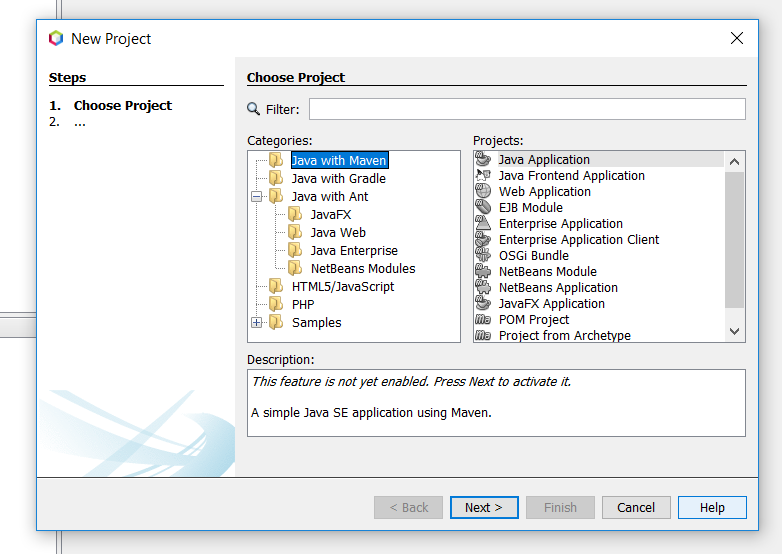 Eric Barboni has done a great job setting up the mavenutils repository, that holds different plugins that will make it possible to start publishing the NetBeans bits in a Maven repository. See NetBeans m2 plugin for more details.